1. In a large heavy bottomed saucepan, combine the butter, sugar and salt. Cook over medium heat, stirring until the butter is melted. Allow to come to a boil, cook until the mixture becomes a dark amber color and the temperature has reached 285 degrees F (137 degrees C). Stir occasionally. 3. 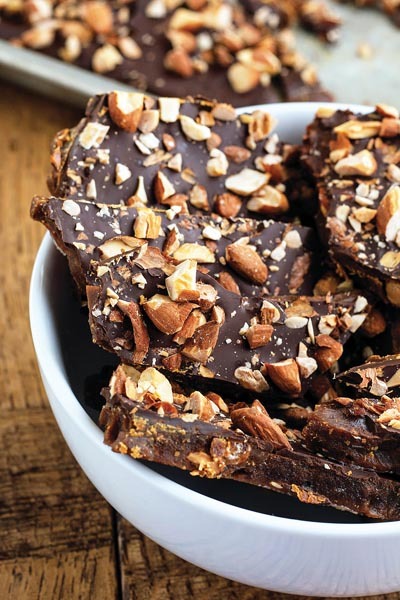 As soon as the toffee reaches the proper temperature, pour it out onto the prepared baking sheet. Sprinkle the chocolate over the top, and let it set for a minute or two to soften. Spread the chocolate into a thin even layer once it is melted. Sprinkle the nuts over the chocolate, and press in slightly. Putting a plastic bag over your hand will minimize the mess.